If your program uses a simple GUI, always open on the Workbench by default. If you want to give users the option to open on a separate screen, let them define the screen parameters themselves using AmigaOS's Screens editor. In your program’s Settings, provide a string gadget for the public screen name. Alternatively, if your program has no Settings section in the GUI and uses Application Library’s XML-based preferences format, provide a key named “Public Screen” (or similar) for the users to enter the screen name. They can easily edit the prefs file with a text editor or the dedicated PrefsObjectsEditor located in the system's Utilities drawer. 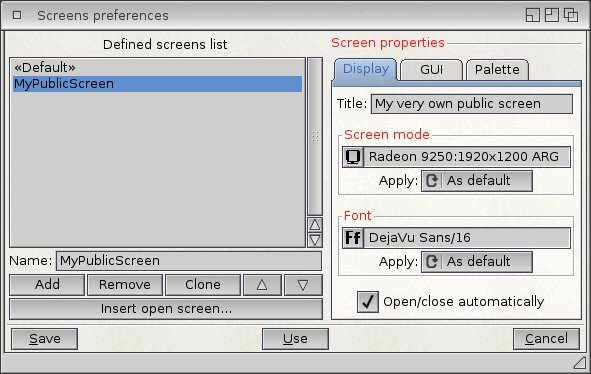 If your program must use a dedicated screen by default (typically: programs that open many sub-windows), open a public screen via OpenScreenTags(). In your program’s Settings, provide a standard screenmode selector and a checkbox option letting the user to clone the Workbench screen parameters (you’ll do this by passing “SA_LikeWorkbench, TRUE” in the OpenScreenTags() call). Make Clone Workbench the default setting. Remember that automatic public screens created through the Screens prefs editor are user-defined. As such, the program(mer) can never quite rely on their parameters. For example, if you write a program that runs on an automatic screen called "MyProgScreen", this screen will likely be defined differently on individual users' systems. So if your program requires a screen of a certain depth, size etc. to function properly, you should open the screen yourself and not rely on the Screens editor. Do not use custom screens unless you absolutely have to. Expect that the user will want to open various programs on your screen. Do not keep public screens locked throughout program runtime. Call UnlockPubScreen() when your program window (re)opens. Be smart and careful in your code that handles window iconification and uniconification. Never assume that your program’s window will reopen on the same screen. Do not keep any global pointers or locks that refer to the original screen or its properties. Now that windows can jump freely to different screens, caching screen pointers does not make any sense. It never did, actually. Always query the window object using GetAttr() when you need the current screen pointer. Use Intuition's GetScreenAttr() or GetScreenAttrs() to find out about screen properties. If you want to give users the option to open on a separate screen, let them define the screen parameters themselves using AmigaOS's Screens editor. Maybe providing the launch of the Screens editor from your app? In your program’s Settings, provide a string gadget for the public screen name. I guess instead, once created , you might as well give the user the opportunity to select it directly from a list of defined public screens? (so as not having to copy the name) Is this easy to implement ? Yes, the OS development will most likely go in this direction. As the Screens editor doc specifically says, "For the near future, it is envisioned that any application will be able to register its screen's name with the system, and also to invoke the Screens editor (through an API call) and present it to the user as the standard means to configure all aspects of its screen's user interface." (See SYS:Documentation/Prefs/Screens.doc). Before that happens I would stay away from custom kludges trying to invoke the editor. you might as well give the user the opportunity to select it directly from a list of defined public screens? I can imagine a string gadget followed by a chooser listing the available public screens (not the ones currently opened but those defined in the Screens editor). Once the OS provides a way to obtain such a list. As you can see, certain aspects of screen handling are still somewhat uncooked. I'll happily update the article when things become set in stone. Very nice read - thank you very much for this guide! An interesting read. I found the following intruiging. 3.2 Greater window mobility Using a new feature in Window Class (introduced in AmigaOS 4.1 Update 3), ReAction-based programs can now “jump” between screens freely during their runtime. How do you achieve this ? In MUI you have icons in the window bar that can jump your application to a public screen, but I see no such icons in any apps using Reaction windows. Or does the ability have to be hard coded by the developer of the application ? I am interested in this because the new shell can do everything that KingCon could apart from being able to jump onto another screen.